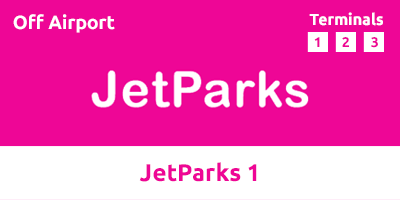 If you're looking for a stress-free parking solution that serves all Manchester Airport terminals then JetParks 1 is for you. Located on the perimeter of the airport, JetParks provides a quality park and ride service at great prices - without compromise on location. Transfers run every 15 minutes, during the airport's operational hours. Along with CCTV, security fencing and regular patrols, JetParks 1 holds a police-approved Park Mark ® Safer Parking Award. This is awarded to facilities that pass police checks ensuring premium security for your car. There are no disabled bays, but buses can accommodate wheelchairs. If you’re using a sat-nav, use the following postcode; M90 5AZ. Keep to the left and take the first exit signposted Terminal 2. At the roundabout at the top of the hill, take the first exit, and then approximately 100 yards further on, turn left onto Thorley Lane. Continue down Thorley Lane, past the Etrop Grange Hotel. The entrance to JetParks 1 is immediately afterwards on your left hand side. Drive up to the barrier. The Automatic Number Plate Recognition system will recognise your vehicle and the barrier will rise. Park your car and head to the nearest bus stop to catch a transfer to the terminal. If the entrance barrier does not rise, please press the help button for 24-hour friendly staff. Follow signs to the airport car park bus stops. Head to Bus Stop 5 and take the transfer to the car park. As you leave, the Automatic Number Plate Recognition system will recognise your vehicle and the barrier will rise.